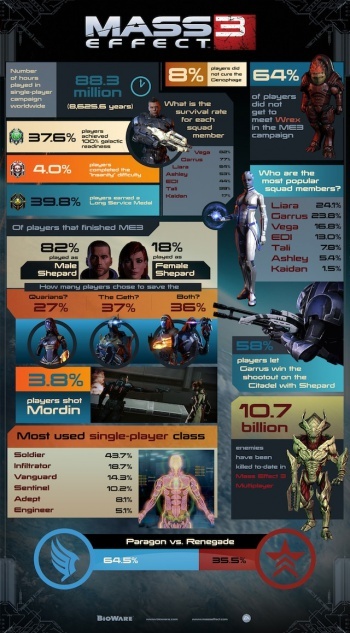 Regrettably, BioWare did not present these statistics with a Shepard's Pie Chart. There are many paths through BioWare's Mass Effect trilogy - player choice has always been a key element of the sci-fi series, and there were plenty of memorable decisions that divided the gaming masses. Evidently, BioWare has been keeping a tally of our actions, and the developers were kind enough to give us a peek at the statistics to see the breakdown of how we, collectively, directed Commander Shepard. These numbers detail some major events from Mass Effect 3, so it really should go without saying, but be warned: spoilers ahoy. One of the most lopsided statistics concerns Shepard herself, or as the majority leaned, himself. 82% of the players who finished Mass Effect 3 were playing as Male Shepard, leaving only 18% playing FemShep. By the numbers, the global average Shepard was a male, Paragon-aligned Soldier. The Soldier class makes sense as the winner there, being the most straightforward, but it's a little surprising that the 43.7% of players who followed that road chose "good with guns" over magic powers and high-tech gadgets. The Adept and Engineer classes, who specialized in biotics and tech, were the least-played classes at 8.1% and 5.1%, respectively. The remaining players chose a hybrid class. As far as NPCs go, Liara and Garrus were the most popular squad members through the Mass Effect 3 campaign. Ashley and Kaidan, as mutually-exclusive members of the party, were the least popular, with Kaidan only getting 1.5% of the love. Urdnot Wrex has always been a fan favorite, but 64% of players never got to see him in Mass Effect 3 - either because he was killed in the first game or, more likely, because he doesn't show up unless you import a save file from previous games. One of the closest calls in the statistics is Shepard's touching duel with Garrus in the Citadel: 58% of players allowed themselves to be outsniped, while 42% showed him up. The two biggest calls in Mass Effect 3 were, arguably, the curing of the Genophage and the resolution of the Geth-Quarian war. A whopping 92% chose to cure the Genophage and save the krogans, so most of us seem to be in agreement there. Only 3.8% of players shot Mordin to prevent him from distributing the cure (and all of you are terrible people). On Rannoch, the choice was more difficult. 27% of you sided with the Quarians, and 37% with the Geth (the remaining 36% achieved a truce). So, did you agree with the overall consensus? Were you upset there weren't more female Renegade Engineers? Either way, it's always interesting to see other people's preferences. Now that the numbers are out in the open, you may even decide to go back and try walking the road less travelled - odds are, there's plenty left to see.